Recently in Ms. Juliet’s Wildflower class in Creston, we appreciated the wonderful qualities of water! The students shared their appreciation for water like: they could drink it, swim in it, jump in puddles, watch the rain drops on a windowsill. We learned about how people use water in their homes, in towns and how to we can preserve local aquatic health. Students also learned about different water realities around the world where water is less available than in the Columbia Basin. 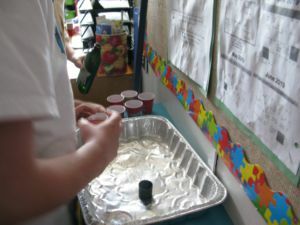 When we delved deeper into the story of water, we found that there were lots of ways we could be good stewards of water!